This snapshot goes beyond traditional measures of postsecondary attainment by tracking the fall 2012 entering cohort over time, and showing persistence, stop-out, and completion rates at the end of each subsequent academic year. The model tracks outcomes for both full-time and part-time starters, and takes spring and summer terms into account. Figure 1 shows yearly success and progress rates for individuals who began college in Fall 2012 as full-time degree-seeking students. It shows the highest level of academic progress made by these students at the end of each subsequent academic year. Figure 2 shows yearly success and progress rates for individuals who began college in Fall 2012 as part-time degree-seeking students. By the end of year four, 20.4 percent had completed a postsecondary credential, while 45.8 percent were no longer enrolled. By the end of year six, 33.0 percent had graduated, while 51.6 percent had left college without earning a credential. 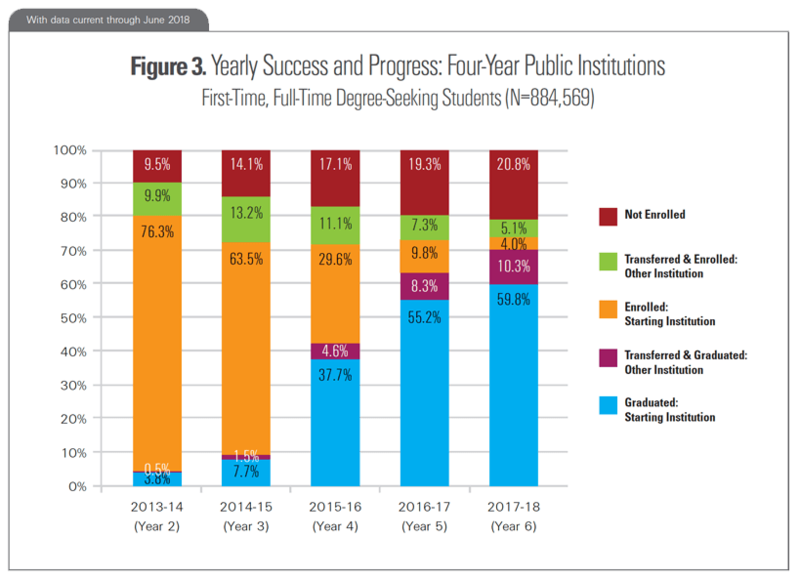 Figure 3 shows yearly success and progress rates for individuals who began college in Fall 2012 as full-time degree-seeking students at four-year public institutions. By the end of year four, 42.3 percent had completed a postsecondary credential, while 17.1 percent were no longer enrolled. By the end of year six, 70.1 percent had graduated, while 20.8 percent had left college without earning a credential. 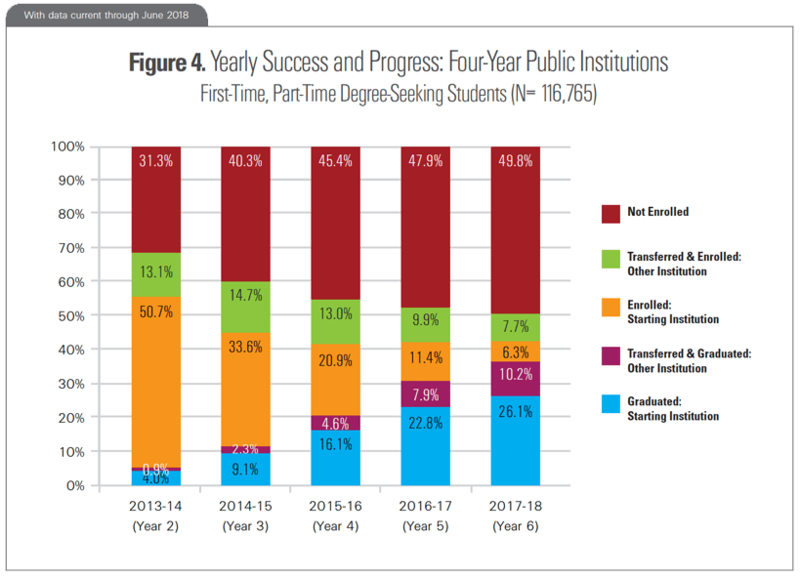 Figure 4 shows yearly success and progress rates for individuals who began college in Fall 2012 as part-time degree-seeking students at four-year public institutions. By the end of year four, 20.7 percent had completed a postsecondary credential, while 45.4 percent were no longer enrolled. By the end of year six, 36.3 percent had graduated, while 49.8 percent had left college without earning a credential. Figure 5 shows yearly success and progress rates for individuals who began college in Fall 2012 as full-time degree-seeking students at four-year private non-profit institutions. By the end of year four, 61.4 percent completed a postsecondary credential, while 12.3 percent were no longer enrolled. By the end of year six, 78.7 percent had graduated, while 15.4 percent had left college without earning a credential. Figure 6 shows yearly success and progress rates for individuals who began college in Fall 2012 as part-time degree-seeking students at four-year private non-profit institutions. By the end of year four, 30.3 percent had completed a postsecondary credential, while 42.2 percent were no longer enrolled. By the end of year six, 43.5 percent had graduated, while 44.9 percent had left college without earning a credential. 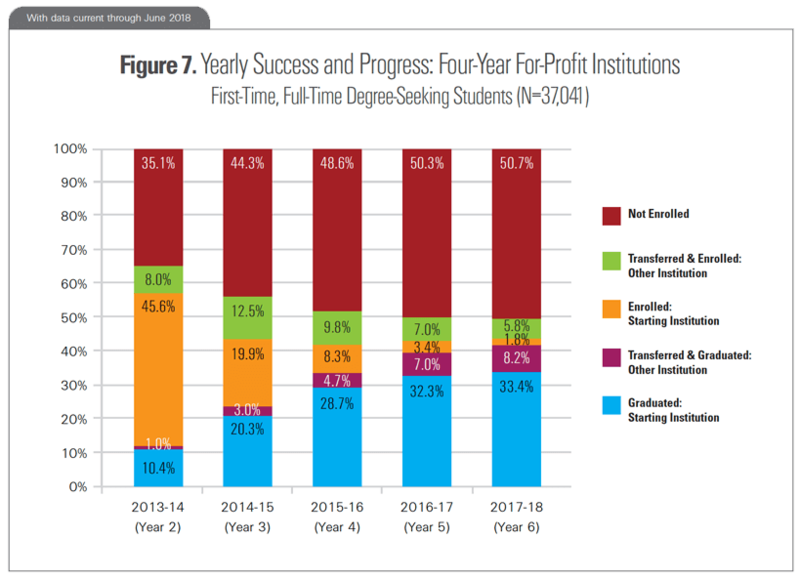 Figure 7 shows yearly success and progress rates for individuals who began college in Fall 2012 as full-time degree-seeking students at four-year for-profit institutions. By the end of year four, 33.4 percent had completed a postsecondary credential, while 48.6 percent were no longer enrolled. By the end of year six, 41.6 percent had graduated, while 50.7 percent had left college without earning a credential. 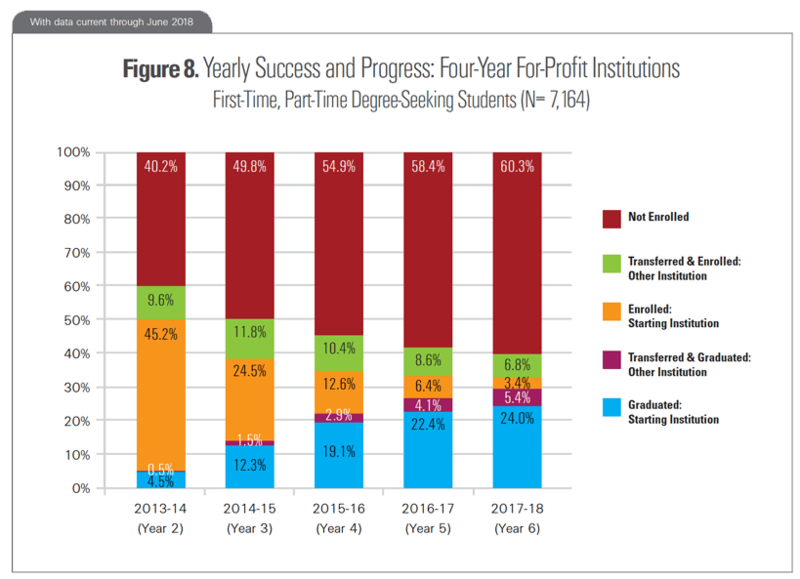 Figure 8 shows yearly success and progress rates for individuals who began college in Fall 2012 as part-time degree-seeking students at four-year for-profit institutions. By the end of year four, 22.0 percent had completed a postsecondary credential, while 54.9 percent were no longer enrolled. By the end of year six, 29.4 percent had graduated, while 60.3 percent had left college without earning a credential. 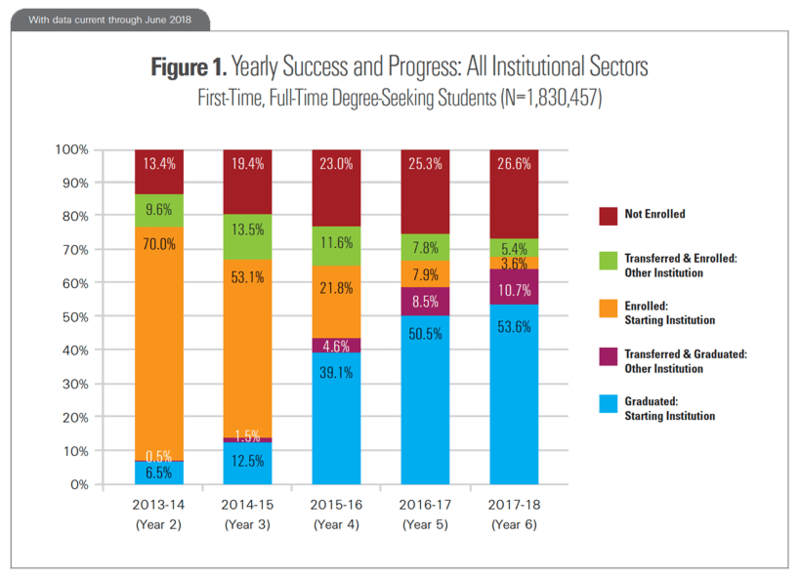 Figure 9 shows yearly success and progress rates for individuals who began college in Fall 2012 as full-time degree-seeking students at two-year public institutions. By the end of year three, 67.4 percent had either completed a postsecondary credential (23.6 percent), were still enrolled in college (42.0 percent), or had transferred to a different institution before withdrawing (1.8 percent). Figure 10 shows yearly success and progress rates for individuals who began college in Fall 2012 as part-time degree-seeking students at two-year public institutions. By the end of year three, 64.7 percent had either completed a postsecondary credential (11.3 percent), were still enrolled in college (51.1 percent), or had transferred to a different institution before withdrawing (2.3 percent). Note on Certificates – Unlike the Student Achievement Measure, this snapshot includes postsecondary certificates in graduation counts for four-year institutions in addition to two-year institutions. The inclusion of certificates increases six-year graduation counts by 1.6 percent at four-year publics, 0.6 percent at four-year private nonprofits, and 4.9 percent at four-year for-profits.